Prostrate spreading groundcover with burgundy new deeply lobed leaves and burgundy toothbrush flowers appearing in winter-spring. excellent for embankments or containers. Attract hummingbirds and bees. Very vigorous grower and can be pruned judiciously. 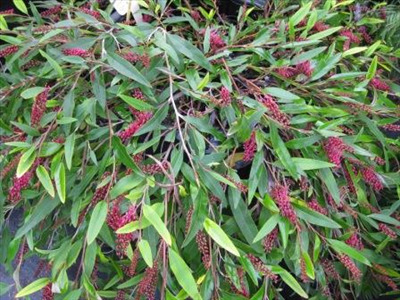 It is grafted onto Grevillea robusta as a standard. It's a hybrid of G. laurifolia x G. wilisii. Propagation Information: Propagate from cuttings.